Having no idea how challenging it would be, at the end of last year I started making a feature-length film from scratch. I wrote the script, drew the backgrounds, shot the footage, recorded the sound effects, recorded the music, recorded the voices and edited everything myself as a kind of one-man production company. The result was Fingerface, what I like to believe is the most romantic story ever told...with fingers. It's about an ordinary guy who meets his dream girl in real life. 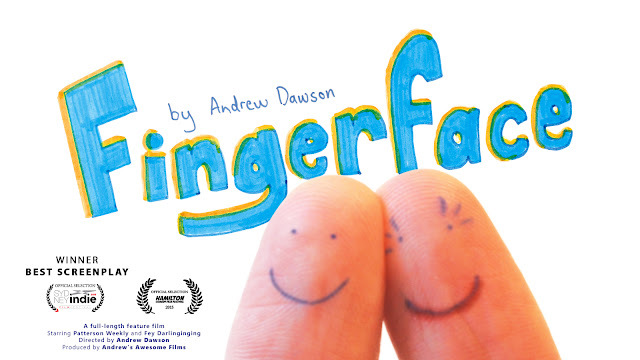 Fingerface has been an Official Selection for the Hamilton Comedy Film Festival and the Sydney Indie Film Festival and I've just found out that it won the Best Screenplay award at the Sydney Indie Film Festival. So, like the characters in my film, I'm smiling.